Welcome to the first lesson in the An Overview of the 2013 Floods in Colorado, USA module. In this module you will learn about the causes and effects of floods as seen during the 2013 Colorado floods. 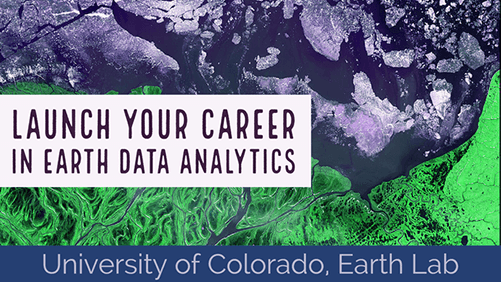 You will learn how streamflow, precipitation, drought, and remote sensing data are used to better understand flooding. How Do You Measure Flood Events and Impacts? In early September 2013, a slow moving cold front moved through Colorado intersecting with a warm, humid front. The clash between the cold and warm fronts yielded heavy rain and devastating flooding across the Front Range of Colorado. 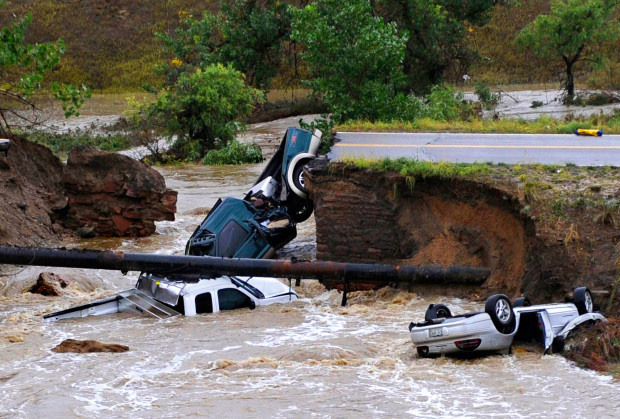 Boulder County, Colorado, located where the Rocky Mountains meet the high plains, was impacted by this flood event. 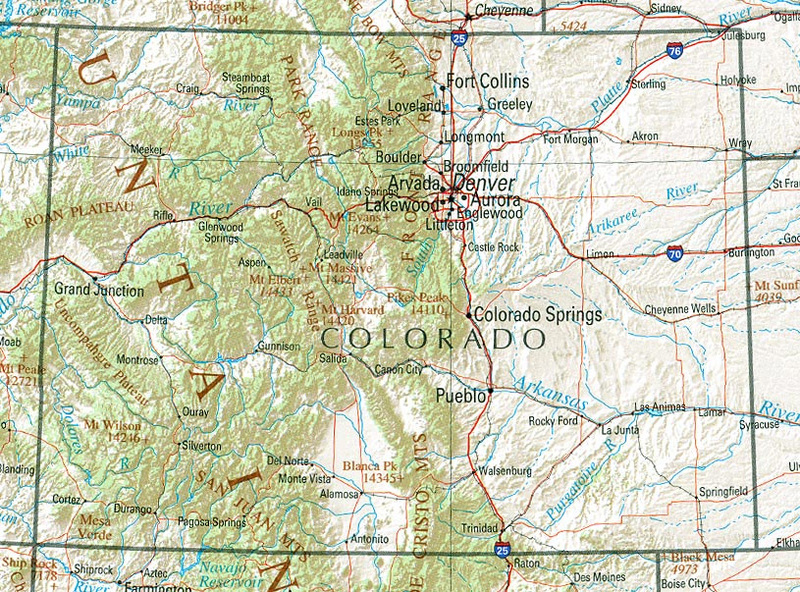 You can see Boulder just northwest of Denver in this map of Colorado. The Front Range runs from Wyoming to Pueblo, Colorado. Source: Wikipedia. A flood is when water inundates normally dry land. Scientists (ecologists) often refer to floods as disturbance events. A disturbance event is a temporary change in environmental conditions that causes a large change to an ecosystem. Fires, earthquakes, tsunamis, air pollution, and human development are all examples of disturbance events. While floods and other disturbance events can happen in the span of a few minutes or days, their ecological impacts can last for decades or even longer. Other scientists may refer to floods as extreme events or even hazards. Vehicles lay submerged in a creek in Broomfield, Colorado. Source: The Denver Post. Aerial image of the St. Vrain River in Boulder County, Colorado before (right) and after (left) the 2013 Colorado floods. Notice how the flood caused the flow path of the river to entirely shift in less than five days. This change in river flow impacted plants, animals, and humans. Source: KRCC. Boulder County, and Colorado in general, are susceptible to both flash floods and river floods. Flash floods, like the 2013 Colorado floods, are sudden and intense increases in streamflow, usually due to extreme weather. River floods occur more slowly and are more predictable. The 2013 floods are classified as a “100 year flood.” This means that a flood of their magnitude has a 1% chance of occurring each year. The first major flood reported in Boulder occurred in 1894 and was also a 100 year flood. Boulder’s first non-native settlers came in 1858, so many unreported floods likely occurred prior to that one. 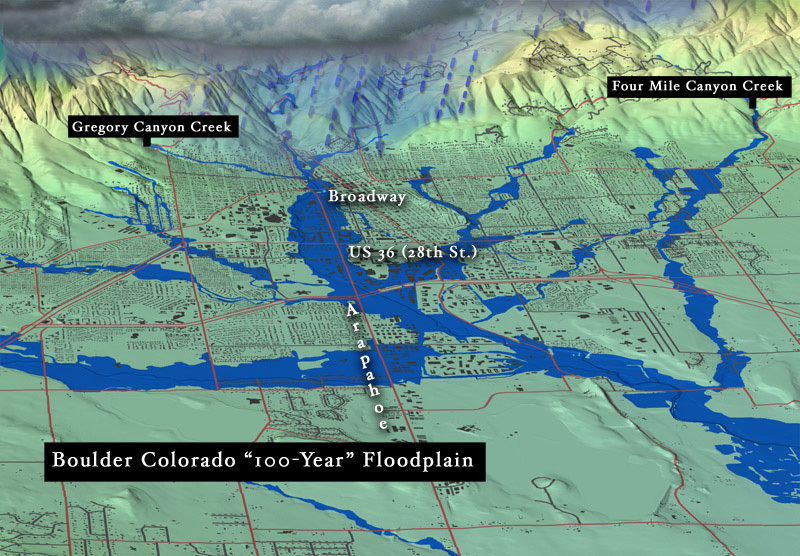 The 100-year floodplain in Boulder. Source: Floodsafety.com. Boulder County’s landscape makes it prone to flooding. The nearby mountains create steep slopes and canyons which act as chutes ejecting water into the downstream plains. These mountains also create atmospheric conditions that lend to frequent isolated storms. In addition, the Front Range of Colorado is susceptible to wildfires and drought. These disturbance events make soil less able to absorb water, which both increases the likelihood of and exacerbates flooding. You can measure causes and effects of floods with a variety of data types including precipitation data, drought indices, stream discharge data, lidar terrain data and other remotely sensed imagery that shows areas that have visually changed due to erosion, mudslides and other impacts.